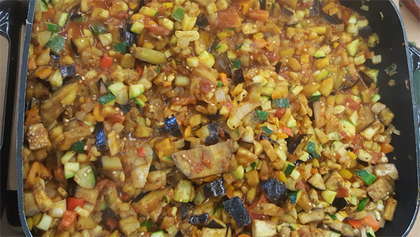 This French Ratatouille made with eggplant and veggies is fresh-from-the-garden good. Start by peeling the eggplants, if desired, and cut/chop them into small bite-sized cubes. Set the eggplant aside and sprinkle 1 tbsp. of apple cider vinegar all over cubed eggplant. Mix well. Feel free to give the eggplant a touch of salt and let it sit while you move to prepare the rest of the vegetables. Dice the sweet bell peppers, onions, zucchinis and tomatoes into cubed bite sized pieces and mince the garlic. The vegetables will be cooked one by one, so keep the veggies in individual bowls. After dicing all of the vegetables into cubes, begin warming a tablespoon of extra virgin olive oil in a large skillet over medium-high heat. Begin to add the garlic and onions. Sauté until the garlic and onions have softened a bit and are just beginning to brown, about 6 minutes. Add in the sweet bell peppers, zucchinis, tomatoes and eggplant into the skillet. Add another teaspoon of oil to the pot and sauté the vegetables. Add a pinch of salt, fresh thyme, rosemary and basil, & add in your favorite tomato basil sauce into the skillet. Add in 2 teaspoons of Apple Cider Vinegar into the skillet. Let it sauté for approximately 20-25 minutes on medium to high heat. This will create a delicious stew-like consistency. After the vegetables are all thoroughly cooked, feel free to remove the thyme sprigs. Feel free to add more basil to your liking as you serve the bowls as a final touch garnishing. Remember Ratatouille can be served hot, warm and even cold. ENJOY! !